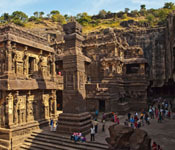 Ellora Caves is an ideal example of the rock-cut architecture of India. Structures were excavated out of the vertical side of the Charanandri hills to form the 34 "caves”. Between the 5th and 10th century, Viharas, Mathas and Jain, Hindu and Buddhist temples were built here by the rock cutting technique.There are 12 Buddhist (caves 1–12), 17 Hindu (caves 13–29) and 5 Jain (caves 30–34) caves built here. The religious harmony of that era of Indian history can be understood by the close proximity of these caves. The Archaeological Survey of India has declared it a protected monument. The ‘Decan Trap’ is the basalt rock volcanic formation of Maharashtra and the caves are cut out of the Decan trap. The term trap used for step like formation of volcanic deposits has a Scandinavian origin. Terraces with flat summits have been formed due to weathering away of these rock formations. The channels that once allowed the flow of volcanic lava can also be seen at Ellora near cave 32.The brownish red color of these channels is due to overheating by the lava. The Grishneshwar Temple located nearby was constructed using similarrocks and the flooring of pathways at Bibi-ka-Maqbara was also done using a similar rock. The caves are hewn from the hills of Sahaydri ranges of the Deccan. These hills belong to the Cretaceous era of the Geological time scale that is; they are about 65 million years old. The western surface of the hills is used extensively to cut these caves out. The hills rise sharply from the plains that surround these on the south and west. Several streams flow through the hills. One of the most important streams is Elaganga that drains into a tributary of the Godavari River, Shiv. The Elaganga flows vigorously during the monsoon season. During this season, waters of the upstream barrage near Mahishmati overflow. A crashing waterfall is formed near cave 29 when the rapidly gushing waters land at “Sita-ki-nahani”. These caves built during the 5th-7th century were thought to be the oldest structures. It was thought that caves 1-5 were built in the first phase between 4th and 6th century and caves 6-12 belonged to the second phase between 7th and 8th century. This however, has been proved wrong by modern scholars who have made it clear that some Hindu caves (27,29,21,28,19,26,20,17 and 14) were built even earlier. Cave 6 is the earliest Buddhist cave which precedes caves 5,2,3,5 (right wing), 4, 7,8,10 and 9. Caves 11 and 12 are the youngest of these caves. The construction period of all these Buddhist caves was 630 to 700. Monasteries or Viharas are the main structures here. These Viharas are large, spacious buildings with multiple storeys. They usually have kitchens, living quarters, sleeping quarters and other rooms carved directly into the face of the mountain. Some caves even have shrines that include carvings of Gautama Buddha, saints and bodhisattva. Skilled sculptors have endeavored to give a wooden look and appeal to the stone in some caves. Cave 10 (refer map) a chaitya hall (chandrashala)is the most famous Buddhist cave. This cave is better known as 'Vishvakarmacave' or the 'Carpenter's Cave'. A Stupa hall that resembles a cathedral is built beyond the multi- Storeyed entrance. This Stupa or Chaitya has a carved ceiling that looks like wooden beams. At the centre there is a statue of Buddha sitting and preaching. This statue is 15 feet tall. The first 9 Buddhist caves are monasteries. Cave 11, Do Tal and cave 12, Tin Tal has three storeys each. The period of construction of the Hindu caves was from middle of sixth century to the eighth century end. The Kalachuri period saw the construction of the early caves (17-29). Caves 28, 27 and 19 were the first caves on which work started. Then caves 29 and 21 were constructed which turned out to be the most impressive caves of the early phase. Along with these two, construction work also went on at Caves 20 and 26, and at Caves 17, 19 and 28 a little later. During the Rashtrakuta work began in Caves 14 and 15 and was culminated in Cave 16. The different styles, creativeness and execution skills are showcased in each cave. Some caves were so complex and detailed that they had to be planned through several generations as well as required their co-ordination to complete. The entrance of the Rameshvara (Cave 21) has figurines of Hindu river goddesses Ganga and Yamuna. The design of Dhumar Lena (Cave 29) is similar to the cave temple on the Elephanta Island located near Mumbai. Several well sculpted sculptures can be seen in the Ravan ki Khai (Cave 14) and the Nilkantha (Cave 22). No significant sculptures or artworks are found in any of the other Hindu caves, including the Kumbharvada (Cave 25) and the Gopilena (Cave 27). There are five Jain caves at Ellora belonging to the Digambara sect. They were built in the ninth and tenth centuries. Jain philosophy and traditions of Jain culture are revealed in these Jain caves.Even though they are small as compared to others, the artwork and sculptures of Jain caves are extremely fine and detailed, reflecting on a strict sense of asceticism. Chhota Kailash (cave 30), the Indra Sabha (cave 32) and the Jagannath Sabha (cave 33) are the most important remarkable shrines of Jains. Cave 31 hasn’t been finishes and has just a shrine in a hall with four pillars. The opening on the left of Cave 33 leads to Cave 34 which is a small cave.Jains are especially interested in Samvatsarana, the hall where Thirthankara preaches after the attainment of omniscience. This hall can also be found in Ellora. You can reach Aurangabad, the nearest airport by flight. 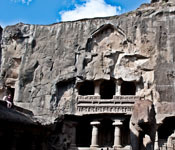 With daily flights from Delhi and Mumbai, Aurangabad is the nearest (domestic) airport to the caves. It is only 15 km from the caves and has flights directly from Mumbai, Jaipur, Delhi and Udaipur. Aurangabad is also the railway station closest to these caves.There are regular trains from Hyderabad, Amritsar, Delhi, Mumbai etc. The train journey from Mumbai is overnight. For inter-state buses, Aurangabad is the nearest location.Aurangabad is around 30 Km away from Ellora. A reserved Auto will charge around Rs 350-400 for the trip. Government Buses also run from the Aurangabad Central bus stop. While travelling from Delhi or Mumbai, it is best to alight at the nearest station, Jalgaon which is 59 km from Ajanta. You can visit these caves between 9.00AM to 17.30PM Indian Standard Time (IST) Ellora Caves remain closed on Tuesday. But, on all national holidays, these caves remain open. Hotel Kailas, the nearest hotel to Ellora is just a few meters from the entrance. Here, they offer standard rooms as well as cottages. The cottages that overlook the caves have slightly higher prices than the other ones. 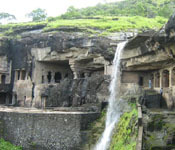 Another option is to stay at Aurangabad and visit take a day trip to visit the caves.